I recently posted about my finished Lissadell sock for a test knit. Luise O'Neill of Impeccable Knits generously let me interview her, and run a giveaway for the pattern. Join me in getting to know this designer. Was there an inspiration behind your name, Impeccable Knits? I was looking for a brand name that would reflect both my first love in knitting (cables) and my commitment to creating excellent patterns and one of my daughters suggested the name. I thought it was perfect and am doubly pleased that it makes me think of her every time I see it. My maternal grandmother taught me how to knit before I started school so I must have been about 5. I don't really remember actually learning but I do remember that my grandmother was never without either embroidery or knitting needles in her hands. Do you just knit, do you crochet or any other craft? I don't think I've ever met a craft I didn't like! I used to do a lot of sewing, quilting, crochet and embroidery but these days most of my hours are spent with knitting needles. Do you start with the stitch pattern, and decide what to make with it, or do you start with the type of project then find the stitch pattern? It really depends -- sometimes it's one and sometimes the other. There doesn't seem to be a consistent pattern (oops, bad pun!) as to how any given project begins. And often a project that begins with a stitch pattern ends up morphing into something totally different as I work on swatches and stitch combinations. I've had a sweater sleeve idea turn into a sock and a shawl idea become a hat. It's always a marvelous adventure. Any comments on Lissadell socks? The Lissadell socks started out with a stitch pattern (from one of Annie Maloney's beautiful stitch dictionaries) which I thought was perfect for a spring/summer/fall sock -- some cables with a touch of lace to make them airy. I also wanted to something a little different in the overall design and so these became a lovely adventure in trying out a new toe technique. 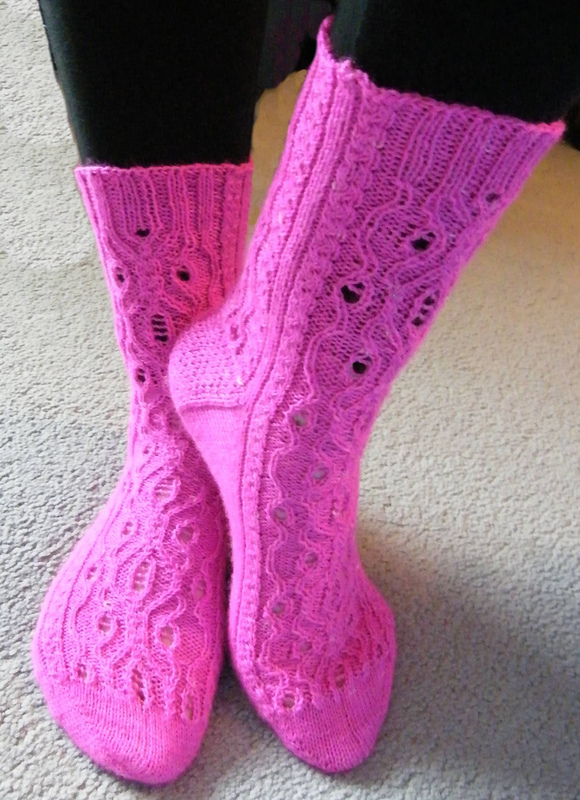 Luise has kindly let me giveaway a coupon code for her newest socks, Lissadell. The coupon code will give you the pattern for these socks free on Ravelry. Please check out her other patterns available on Ravelry. Affliate Link: Luise O'Neill also has patterns on Knit Picks website. Check them out to buy the yarn, but consider buying directly from Luise on Ravelry.